Read more information about volunteering or doing research at the McGuire Center for Lepidoptera, FLMNH. 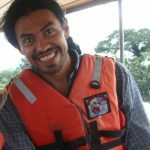 Patricio is a postdoc coordinating the field work in Ecuador to test the hypothesis that stronger biotic interactions contribute to the latitudinal gradient in species richness of Adelpha. 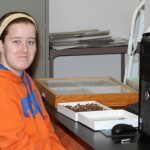 Denise is working on a PhD in the Entomology and Nematology department, on the evolution, behavior and systematics of Hermeuptychia butterflies. Elena finished her Masters degree in summer 2011 and started her PhD in the Entomology and Nematology Department in spring 2012. 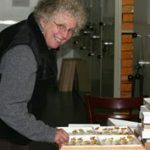 She is studying the role of wing pattern and geography in the evolution of Preponini, a group of spectacular neotropical Charaxinae, and has re-curated the McGuire holdings of the group. 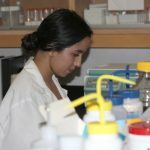 Fernanda returned to UF in Fall 2011 to begin her PhD. She is examining seasonality in three west Ecuadorian forest butterfly communities across multiple microhabitats. Jane has polished off curation of the neotropical Dismorphiinae, Pierinae, Ithomiini, Nymphalinae, Cissia and is now working on Adelpha. 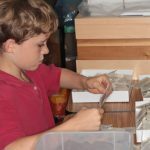 Jamie helps with curation of Neotropical butterflies. Stephanie is a high-school student working on a taxonomic revision of the genus Chloreuptychia. 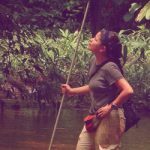 Nicole is working on the systematics of Ecuadorian Forsterinaria, including morphological and molecular study, and is a University Scholar. 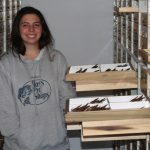 Alexandra helped prepare Euptychiina samples and is now working on databasing Ithomiini and Euptychiina. Gebreyes helped curate Adelpha and is now helping with molecular work on Euptychiina. Sarah is working on obtaining nuclear gene sequences for the Euptychiina phylogeny. Brittany is dissecting Taygetis to help figure out species limits. Tyler is also working on dissecting Taygetis. Vanessa is working on DNA barcoding of various euptychiine genera. Lindsay is using DNA barcoding to help define Taygetis species. Vladimir worked on our NSF BRC grant to curate and integrate the Ulf Eitschberger collection of Lepidoptera, focusing in particular on Lycaenidae and Satyrinae. Marianne worked as a postdoc at UF from 2014 to 2015 and continues to lead the research on the molecular phylogenetics of Euptychiina for our NSF grant. Shinichi Nakahara, MSc, UF, fall 2015. Shinichi revised the systematics of the satyrine genus Euptychia for his Masters degree, in addition to working on the taxonomy of several other euptychiine genera. Geoff Gallice, MSc, UF, summer 2011; PhD, UF, summer 2015. Geoff studied the relationship between abundance and range size in Neotropical butterflies. Elena Ortíz, MSc, UF, summer 2011. Elena’s research examined the generic classification and species limits in the charaxine tribe Preponini. Pablo Sebastián Padrón, MSc, UF, summer 2010; PhD, UF, fall 2014. Sebastián’s MSc thesis focused on the systematics, evolution and biogeography of high elevation Andean satyrines, particularly the genera Altopedaliodes and Neopedaliodes. His PhD involved the molecular systematics, evolution and biogeography of Catasticta, a diverse group of Neotropical montane cloud forest pierid butterflies. María Fernanda Checa, MSc, UF, summer 2010. Fernanda completed her thesis on spatial and temporal patterns in abundance and composition of an Ecuadorian dry forest butterfy community. Michelle Dunbar, 2015. UF undergraduate working on DNA barcoding of Hermeuptychia. Lauren Holian, 2015. UF undergraduate dissecting Caeruleuptychia. Sridhar Chandrasekaran, 2015. UF undergraduate working on DNA barcoding of Magneuptychia. Courtnie Moodie, 2015. UF undergraduate dissecting Hermeuptychia. Ana Parus, 2014-2015. UF undergraduate working on DNA barcoding of Hermeuptychia. Tatiana Pomerantz, 2014-2015. UF undergraduate working on systematics of Euptychoides. Jessie Cable, 2015. 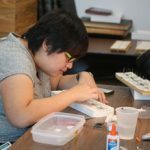 UF undergraduate curating Adelpha. Sumayya Mujeeb, 2015. UF undergraduate curating Adelpha. Kate Lee, 2015. Curation of Taygetis. Caroline Nickerson, 2015. Systematics of Euptychiina. Neha Jagtap, 2015. Systematics of Euptychiina. Michelle Modena, 2015. Databasing of Euptychiina. Allie Sourakov, 2013-2014. Curation of Euptychiina. Kirsten Verster, 2012-2014. REU scholar working on systematics of Tegosa. Amanda Anderson, 2013-2014. Systematics of Euptychiina. Natalie Harrison, 2013-2014. Systematics of Euptychiina. Addison Nguyen, 2013-2014. Systematics of Euptychiina. Veronica Ramirez, 2013-2014. Systematics of Euptychiina. Beatrice Caruso, 2013-2014. Systematics of Euptychiina. Lei Xiao, 2010-. Lei was so indispensable as a molecular lab volunteer she is now lab manager. Derick Crespo, University of Puerto Rico, 2012. Visiting REU scholar working on systematics of Tegosa. Luisa Lima e Mota, UNICAMP, 2011. Visiting scholar working on morphology and phylogeny of Pteronymia. Noel Cawley, 2010. Georeferencing of specimen localities from Venezuela. Craig Segebarth, 2010. Spreading of Ecuadorian specimens and curation of the Ulf Eitschberger collection. Natasha Wright, 2009-2010. Curation of the Ulf Eitschberger collection. Lindsay Segawa, 2010. Databasing neotropical Pieridae. Nina Zagvazdina, 2009-2010. Curating neotropical nymphalid genus Actinote, and assisting with curation of Ulf Eitschberger collection. Jackie Tseng, 2009. Curating neotropical papilionid genus Heraclides. Ellen Walker, 2009. Databasing and curating Catasticta and Leptophobia. Neil Rosser, 2009. Curating and databasing Heliconius and related genera to look at geographical patterns of speciation. Neil is a PhD student at University College London (UCL). Lauren Johnston, 2008. Curating and databasing neotropical Papilionidae. Judi Muscle, 2008. Databasing specimen data from papered Ecuadorian butterflies collected over the last couple of years. Stephanie Borrios, 2008. Databasing of specimen records for Dismorphiinae. Morgan Edwards, 2008. Ecological niche modelling for Andean butterflies to assess IUCN threat status. Glaucia Marconato, Universidade de Sao Paulo, 2007. Visiting scholar conducting research on a phylogeny of the Charaxinae based on morphological characters. Sam Landrian, UF, 2007. Databasing specimen locality information for Heliconius butterflies from the donated collection of Walter Neukirchen. Isis Jaimez, 2007. Curation Pronophilina, a diverse and complex group of montane neotropical satyrines. Kevin Carty, UF, 2006. Databasing of literature records for Biblidinae and curation of Ithomiinae. Lyndall Brezina, UF, 2006. Databasing of Ithomiinae specimens. Shelly Flanagin, UF, 2006-2007. Curation of Papilionidae, databasing literature records. Jimmy Nguyen, UF, ZOO 4905 Individual Studies. Curation and databasing of Dismorphia, Scada and Aeria, and study of relative abundance of putative mimics and models in a classic Batesian mimicry system. Ian Segebarth, 2006-2007. Curation, identification and databasing of Ecuadorian butterflies.